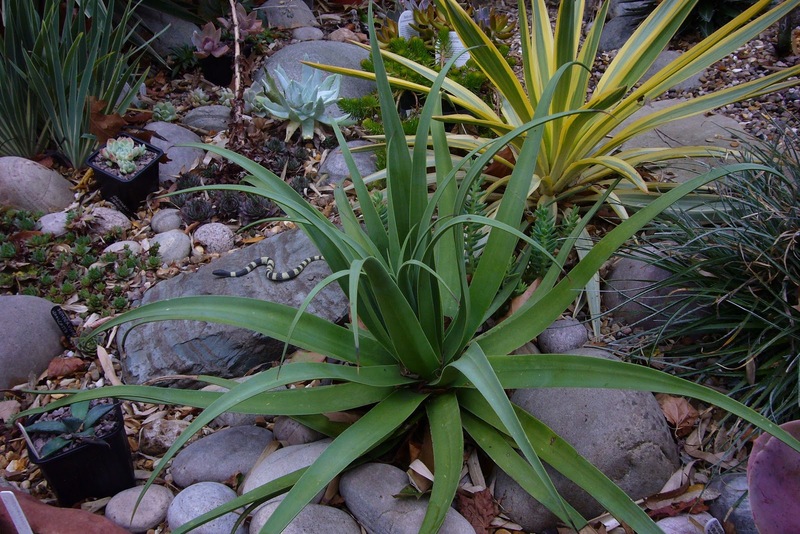 For me this is one of the the most under-rated agaves, not just for the UK given how cold hardy it is, but in general for its squid like looks. I have several of different sizes and they have all lived outside pretty much since I got them. They don't get any protection and sail through without problems or damage. One good thing about them is that it gains its winter hardiness from a very small size, unlike many agaves. This is the largest before it was dug up for the move, during which I found it was starting to pup so should be a nice clump. This makes them very easy at this time of year; they do take part in the fight for space in the cold frames. 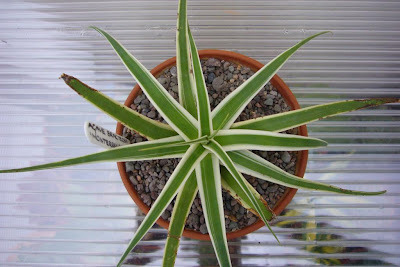 Until this year that is, when I am the proud owner of the variegated from a. bracteosa 'Monterrey Frost". This is a plant that has taken me years to find (at a reasonable price) and having finally got one I am not risking it outside even in one of the cold frames. It is plants like this that best highlight the difference between the USA and the UK, the blog Danger Garden showed a nursery with rows of these all lined up, while the Piece of Eden has one planted out on one of their banks (assuming the puppies haven't eaten it). These new variegates and hybrids make it into general cultivation so much quicker, and while it is hopefully still considered a special plant, it wont break the bank to purchase and so can be used more freely in the garden. In the UK though it is a different matter, you pretty much solely find this one on ebay and they can go for stupid money. I had to apply my golden rule, which is to decide the price the plant is actually worth and not be tempted to bid higher. You will always get it in the end, even if you have to wait a year. So for the time being, this is one agave bracteosa that will be firmly mollycoddled inside out of reach of frosts (and slugs). That is until like the USA, I can pop down to the local garden centre and pick up a couple of spares. You are confirming my fears about moving to Europe!!! I am stock piling seeds of the plants I want to take with me, or at least looking for venders online. There is no doubt you will not find it as easy to get some plant in the UK, especially agaves. Seeds though is usually not a problem if you are that patient. On the plus side, at least you will be cooler in summer, does that help? Even though I might have dozens at my fingertips I still would rather not loose my 'Monterrey Frost' so it will be spending the winter inside. I've read it's a bit less hardy than the straight up A. bracteosa. It's good to know you still value something that little bit special. I must admit though, my experimenting side would get the better of my if I were you, I would be tempted to try one in a cold frame then if it did ok, under a rain cover. Just to see.